Added to my collection today is RAYMOND BENSON's final James Bond book THE MAN WITH THE RED TATTOO. It was released 2002 by Hodder & Stoughton and cost £18.99 upon release. Here I need to mention that the movie tie-in for DIE ANOTHER DAY was released in November 2002 and was Raymonds last Bond book but that was an adaptation of the screenplay written by Neal Pervis and Robert Wade. I bought my book (the above and below photo) out of Ebay and paid £13 for it. I consider this a really great catch. Sadly the cover design for Raymond Bensons James Bond books have aged really quickly. What might have looked good and advanced in the early 2000 now looks old and easy to do yourself in Photoshop. I think that THE MAN WITH THE RED TATTOO has the best cover design out of the books Benson wrote. One can actually start wondering if the writer had anything to say about the cover design for his books and also why the Ian Fleming Publications did not spend more money on the books design. I am sure that should have helped the sales of these books a lot. Just like the great cover design we just saw on TRIGGER MORTIS (UK that is!). "When a British businessman and his family are killed in Japan, James Bond suspects a mass assassination. Investigating with the help of beautiful Japanese agent Reiko Tamura and his old friend Tiger Tanaka, Bond discovers that two powerful factions controlled by the mysterious terrorist Goro Yoshida are playing God. Between them they have created the perfect weapon, one small and seemingly insignificant enough to strike anywhere, unnoticed. 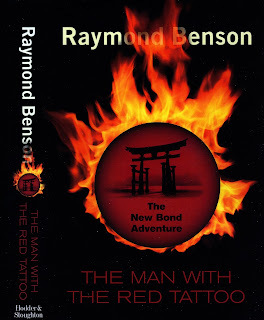 With an emergency G7 summit meeting just days away, it's a race against time as Bond confronts both man and nature in a desperate bid to stop the release of a deadly virus that could destroy the Western world." 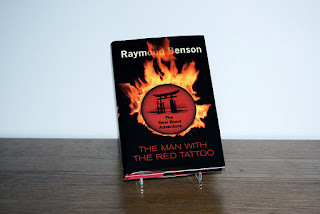 If you wish to buy the paperback version of THE MAN WITH THE RED TATTOO you can sponsor the blog buy buying it below.